If you have lame, older, cars like we do you need this charger! We have it in our Van and it's perfect to charge both of our phones and the GPS and other items while we drive! If you have a man in your life that is way into meat-smoking, or bar-b-que then he will love this book. Matt has read a lot of books over the past 7 years of his love affair with his meat smoker and this is his favorite book. He loves the recipes for homemade sauces and rubs and this is his go-to guide for all things meat! It's not the fanciest looking book, but it IS the best. This is a new book and has great reviews. The author runs a restaurant in Texas which Bon Apetit magazine declared the Best BBQ in America. So, he knows what's what when it comes to meat smoking. This is likely to be our next BBQ book purchase since we love this guy. If you've got an outdoorsy man in your life (or a backyardsy one like me) he will love this. A teeny-tiny, compact, camping stove (it's under 4 oz in its case)! Boils water in about a minute at sea level. and it's UNDER $10!! Hello, stocking-stuffer!! This is the best purchase I have made in years! We have the white version of this speaker and we use it almost every day. You just use your iPhone to listen to music through Amazon streaming (if you have Amazon Prime), Tune-In streaming radio or an iTunes playlists. This would be great for a husband who works in the garage and wants to be able to have radio or music playing while he works. We have also made a party playlist and put this on our back deck and played music for parties, since it is weatherproof! The sound quality is amazing. I may get this for my husband this Christmas. It seems like it would be amazingly helpful for handymen! This has great reviews and promises to be a funny read and perfect for the Ron-Swanson-loving man in your life! Please note that I have not personally read this book, so I can't vouch for if there is swearing, etc. We bought these last Summer to use on the beach and in the local pool and it really works! It is amazing for underwater photos, but it's also really great to just protect your phone while at the beach or pool. Yes, it's nerdy, but it's also AWESOME. I read this while at BYU and it is an AMAZING book! It is helpful for ALL men within the church. My husband loves to lug his scriptures around without a tote and periodically lose one of the volumes of scripture. Ha! 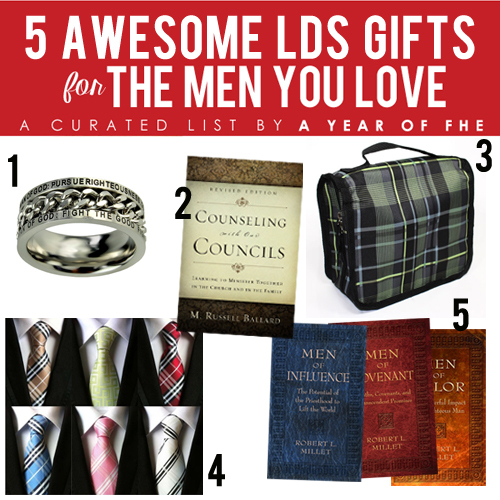 There are so many great scripture totes for men these days that you can find a style that suits the man you are buying for! Can an LDS man ever have enough ties? Not my husband. This set of SIX ties is only $22.99 right now (you can choose from 16 different sets!) and they have GREAT REVIEWS! There are three books in this set. Men of Covenant, Men of Influence, and Men of Valor. Each tackles a different topic of how men can be better instruments in the hands of God. These books have great reviews!